F175™ Series :: Coda Octopus Products Ltd. Compact, lightweight, robust, and accurate position and motion data. Based on F180® technology, the F175™ extends the capabilities of a marine surveyor with an existing survey-grade GNSS receiver by blending this position data with the inertial engine inside the F175 unit. The result is an output solution that supplies highly accurate and smoothed variables such as heave, pitch, roll, heading, and position. With the ability to receive position data from a number of GNSS receiver systems, the F175 is an out-the-box solution to access precision motion reference data. 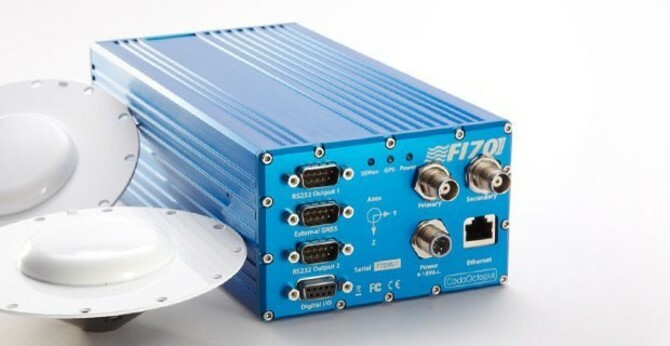 Being an inertial based system, the F175 will continue to output data even during GNSS outages. Through tight GNSS and inertial sensor integration, the blended results are more accurate when compared to the separate and standalone position, heading and motion reference systems. With intuitive and easy to use topside MOTION software, the F175 can be quickly mobilized on any vessel of choice. With a standard array of data output formats, the F175 is compatible with all multi-beam recording packages such as HYPACK® and QINSy. The F175 is a cost-effective access point to expand the capabilities of existing survey-grade GNSS receivers with an inertial engine in order to determine accurate vessel attitude, position and heading. Other GNSS systems can be integrated via standard NMEA strings, although the accuracies of outputs are higher when using the native data format. The F175-T1™ is a GNSS-aided inertial system that extend the functionality of a client's single antenna Trimble® GNSS system by providing very accurate outputs of position, roll, pitch, heave and heading. In addition, the F175-T1™ greatly improves robustness to GNSS dropouts and any signal multipath. The F175-T2™ is a GNSS-aided inertial system that extend the functionality of a client's dual antenna Trimble® GNSS system by providing very accurate outputs of position, roll, pitch, heave and heading. In addition, the F175-T2™ greatly improves robustness to GNSS dropouts and any signal multipath. The F175-T2™ is provided with a set of antenna splitters, to allow the system to share antennas with those of the Trimble® GNSS system it is to be integrated with. The F175–H™ is based on the F175–S™, and extends the functionality of your Hemisphere VS-330 GNSS system to provide very accurate roll, pitch, heading and heave for hydrographic survey applications.